Monday evening, right after work, I was changing out of the competition tires to street ones, and remembered that I had to install anti-rattle springs on the rear brakes. 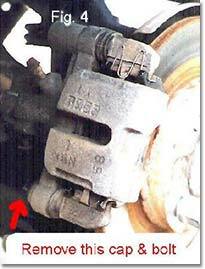 Initially, there was nothing wrong with the brakes that I could tell, but with the pads wearing over time, the brakes started making a "ka-klink!" sound each time I'd roll over a bump. It got pretty embarrassing, but at that point I was not yet sure what the problem was, so I asked the mechanic who takes care of Bonnie to check the rear of the car for anything loose, and behold, he discovered that there were no anti-rattle springs installed on the rear brakes. His quote was $50 to install them for me (just under an hour of work), but he also mentioned that to do it, one only needed needle-nosed pliers and could do it with just the wheel taken off, and no further disassembly (so the picture actually does not apply, but you can see the upper anti-rattle spring nicely in it: it's the M-shaped clip straddling the caliper). So knowing how frequently I take the wheels off the car when changing tires for autocross, I said I'd try to do it myself and come surrender if I fail, and with a nod he reached into some box on a shelf, and counted off four springs into my palm: two per brake. About a month later, here I was, sitting on the glowing pavement amid assorted wheels and tools, trying to fiddle in the springs, in my condo's parking lot. The first one took longest, but once I figured out the position and the 3D geometry of fitting in of each spring, it was all fine. Just as I was finishing up the second spring on the driver side, a four-door sedan pulled in from the street and stopped next to my car. A woman, about my age, who I never saw before, rolled the window down and asked if I was broken down or needed any help. I thanked her, but had to say that I did not need help, and that I was rather enjoying myself, tending to the needs of my car in the parking lot. The lady wished me a nice evening, rolled the window up, and drove off. I must say, it was exceptionally nice of her to stop and offer help when she saw me from the street. Kudos to the anonymous lady.